Hello, lovelies~ It's time for another foundation review! My favorite makeup category, yeay! Today, it will be from Estee Lauder and their new Double Wear Stay-in-Place Makeup with a built in SPF 10. I've been using this for about two weeks and here is the report. Enjoy, hehehe..
As with most high end foundations, they tend to have a classy look to their packagings. This one from Estee Lauder is packaged in a glass bottle with a twist off golden cap inside a blue box. It would be nicer to have a pump to dispense the product so as to prevent extra foundation from spilling on my hand. As for the ingredients, it uses dimethicone to achieve that smooth finish. The excess oil on my face is presumably maintained using alumina. For preservatives, this foundation uses BHT, Imidazolidinyl urea and phenoxyethanol. Sometimes, my skin may have a reaction against imidazolidinyl urea since it may be a skin irritant to some people with sensitive skin. However, since I don't wear heavy duty foundations everyday, I didn't have any unpleasant experience with it. The shade that is closest to my skin tone is 1N2 also called Ivory Cream. It has a neutral undertone, which always works best for most skin tones because it has equal blend of pink and yellow undertone. Just in case you lost the box, you can always see the shade number and/or name on the bottom of the glass bottle. Aside from the twist off cap and pump absence, the texture of this foundation is similar to what a lotion would look like. It's neither runny as water nor thick as cream, it's just in between. I find that it dries quite fast, so I tend to use a foundation brush whenever I apply this foundation to my face. I tried using fingers, but it ended up staining my fingers and blotchy application. 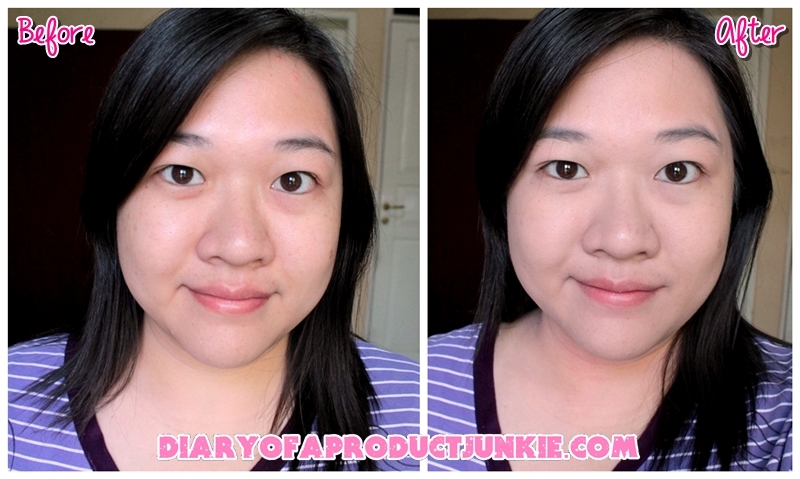 The Foundation Flower method from Estee Lauder really helps to apply this foundation evenly and smoothly. I start from the inside of my face (my nose) and feather it outwards in light stroking motion. It has a matte finish to my face once I blended everything together with my foundation brush. It has medium coverage with one layer of this foundation. I can apply more than one layer of foundation on my face for better coverage, but it looks cakey. I tend to use concealers for better coverage, especially on my sun spot. As seen from the photos, the redness are neutralized and my skin tone looks more even. I also noticed that my pores are slightly concealed that they make the illusion that my face is smooth and poreless. Foundation only in the after picture. No powders or bronzers. One of the reasons why I love this foundation is the longevity factor. It is able to stay on my face for around 8 hours. The oil control is also great on its own with 4 hours shine-free and around 7-ish if combined with a setting powder. Overall, for a foundation that costs Rp 380,000, I feel that this is worth the money. Why? I only need a small amount to make the redness on my face go away. I use a bout two pea sized amount. I think it can last me a whole year until I finish a bottle of this. Hahaha.. However, this is one of the foundation that dries fast on the skin, so I need to blend it immediately after placing it on my face. Also, this would be perfect if it has a pump. That would just make life so much easier for a clumsy girl like me, hehehe..
Anyhoo, I hope this review is helpful for those wanting to search for foundation, especially from high end brands. What is your all time favorite liquid foundation? Tell me in comments below, so I know what to put on my wish list! ini emang di rave banget ya sama semua foundation junkie..
btw ci phanie pasti koleksi foundie & bb cream nya banyak banget yaa~ gimana ngabisinnya itu ci~ hehe..
Haduh, Dil, ngebayangin ngabisinnya aja bingung aku, hahaha.. Untungnya sebagian udah dihibahkan, jadi dah ga terlalu penuh. Cocok buat oily skin kah si Covergirl? hehehe thx buat reply yaaa..